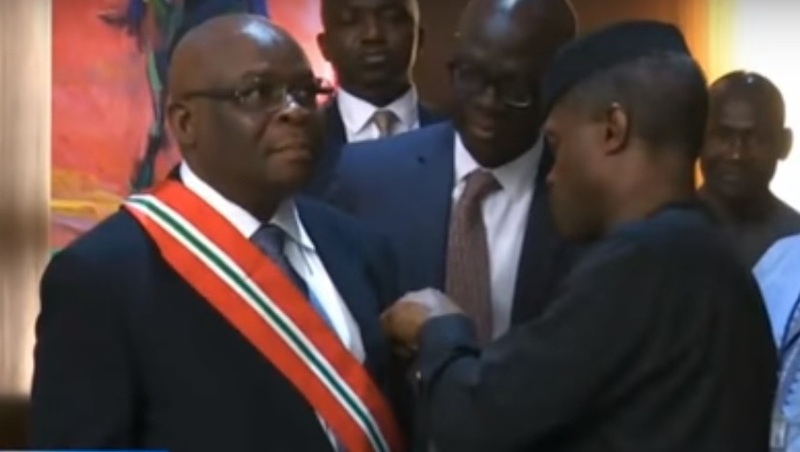 Screenshot of the swearing-in of Justice Walter Onnoghen as the Chief Justice of Nigeria (CJN) by Acting President Yemi Osinbajo, at the Council Chambers of the Presidential Villa in Abuja, [March 7, 2017. Mr. Onnoghen [only] partially declared his assets, but still failed to declare a series of bank accounts, denominated in local and foreign currencies. … The government consequently filed six charges of non and fraudulent declaration of assets by Mr Onnoghen, with trial expected to commence on January 14 at the Code of Conduct Tribunal. The charges against the CJN are based on a petition sponsored by the Anti-corruption and Research-based Data Initiative. According to Signal media, the group has links with current President Muhammadu Buhari. The petition’s author, Dennis Aghanya, was the president’s former media aide between 2009-2011 and currently serves as executive secretary of the research and data group that initiated the petition. In the lead up to Nigeria’s presidential elections in February, the CJN’s criminal charges have triggered speculation that ethnoreligious political dynamics have played a role, as religious and ethnic tensions in Nigeria deepen between the Christian-majority south and the Muslim-majority north. The CJN has denied any wrongdoing. The appointment of Nigeria’s chief justice is usually a straightforward process. The National Judicial Commission (NJC) normally forwards the name of the most senior justice to the president, who appoints and then the legislature confirms the appointment. But that was not the case with Onnoghen, where his religious identity as a Christian man from southern Nigeria may have been a factor. On November 10, 2016, Buhari, a Muslim man from northern Nigeria, “inaugurated Onnoghen as ‘acting CJN’ following the retirement of Justice Mahmud Mohammed at the attainment of the mandatory 70-year retirement age,” according to Punch newspaper. This fueled speculation that Onnoghen might not be made the substantive CJN and could be eased out to make room for Buhari to appoint another northern Muslim in his place. Buhari’s penchant for making “parochial appointments” has deepened the ethnic and religious fault lines in the country. Onnoghen’s appointment as ‘substantive CJN’ came three months later by Buhari’s deputy, Yomi Osibanjo (also a Southern Christian), while performing duties as acting president during his boss’s medical vacation. Making this appointment while Buhari was away further deepened the suspicion. The executive arm of the Nigerian government has a sordid history of intimidating other arms of government. On September 22, 2015, the administration filled similar charges of non-declaration of assets against the Senate President Bukola Saraki (head of Nigeria’s higher legislative house). On July 6, 2018, Nigeria’s Supreme Court dismissed the false charges against Saraki. I’ll be waiting to see the media outlets that would carry this propaganda from the presidency about Chief Justice Walter Onnoghen. If Buhari truly knows nothing about the top jurist’s planned arraignment, he should openly eschew it as a circus and ensure heads roll. Such unprecedented speed and efficiency in Nigeria’s criminal justice administration! It is clear, given the rush with which this matter was conducted, that the CJN was not privy to it and did not conduct its mandatory required disciplinary processes prior to the filing of the Charge before the CCT. Suddenly, we woke to see a petition leaked to the informal or social media, allegedly received by the Code of Conduct on [January 9.] Suddenly, we are told charges have been filed against the CJN. Suddenly, the Presidency is reportedly asking him to step aside! Was he interrogated or interviewed and his own reactions obtained? Babachir David Lawal, former secretary to the government of the federation, was sacked on October 30, 2017, following a grass cutting scandal unraveled by a legislative panel of inquiry that Babachir’s company “received consultancy contract for an intervention agency under his office”. Babachir has not been persecuted — he is campaigning for Buhari’s re-election. In videos widely circulated on social media, the Governor of Kano State, Abdullahi Ganduje, was seen allegedly receiving bribes of US$5 million from contractors. Ganduje, a member of Buhari’s ruling party, the All Progressive Congress, is yet to be prosecuted. Despite this, President Buhari described Ganduje as “a very responsible man”. Under Buhari, the press has been silenced. The labour and trade unions have been silenced. The civil society organisations have been silenced. Public intellectuals have been silenced. The judiciary is being silenced. But nothing is truly lost unless the people are silent. An editorial in ScoopNg described the trial as dubious, pointing out that the judge presiding over the CJN case, Danladi Umar, is also corrupt. Prosecutor Festus Keyamo has conflicting interests as the strategic head of communications for Buhari’s reelection campaign. On this basis alone, the trial of the CJN, a person who has served the country for almost 35 years without a charge should make every Nigerian fretful, suspicious and vigilant … All fingers are pointing to the 2019 elections.